The making of ‘concert’ classical guitars in the UK began after World War II and at the same time, methodologies and techniques were explored and codified by amateur instrument makers. I am currently writing an article that will discuss this at length but in the meantime thought it would be of interest to some people to learn about another one of the artefacts I have come across during my research. I have previously written about Theodorus M. Hofmeister’s plan of the Torres FE26 guitar, which was published in Guitar Review in 1954. I have also written about Clifford A. Hoing’s series of articles for Woodworker magazine in 1955. A similar series of articles by Eric V. Ridge was published in Guitar News in 1956-7 and later republished as a single publication in 1959. Eric V. Ridge was a Committee member of the International Classic Guitar Association (ICGA) and an amateur instrument maker, having already made a few violins. He was encouraged by Wilfred M. Appleby, the Editor of the ICGA’s ‘official organ’, Guitar News, to make use of the Hofmeister plan to construct a guitar and write about his experience. Appleby had previously encouraged Clifford Hoing to write his series of articles for Woodworker and the Hofmeister plan may have been available to him, too. “Owing to the dearth of information available to prospective guitar makers I was forced to the examination of existing instruments, both good and bad and the perusal of short articles which had appeared from time to time in various publications, combining my knowledge of woodworking, instrument making in particular, with a certain amount of commonsense. The original series ran over six issues of Guitar News, from Oct/Nov 1956 to Sept/Oct 1957, coinciding with A.P. Sharpe’s book, Make Your Own Spanish Guitar, which was published in early 1957. An advertisement in Banjo Mandolin and Guitar (BMG) magazine in June 1957 claims that over 1000 copies of A.P. Sharpe’s book had already been sold.1 It was A.P. Sharpe’s book that Jose Romanillos used to make his first guitar and is also the guitar-making publication from that formative period that is most widely recognised today. To his credit, Romanillos also mentions the Hofmeister plan and Ridge’s series of articles in his book on Antonio de Torres, which is what led me to look for them in the Bodleian Library (Guitar Review) and British Library (Guitar News). Guitar makers often work from detailed drawings of instruments made by earlier makers. In his book on Antonio De Torres, Jose Romanillos refers (p. 58, 125-6 & 187 of the first edition) to a plan of Torres FE 26, drawn in 1953 by Theodorus M. Hofmeister, and published in the 1954 issue of The Guitar Review magazine. Romanillos writes that this was “a landmark in guitar construction of the Torres school because, for the first time, guitar makers, professional and amateur alike, could have an insight into the work of Torres and more importantly, into the dimensions to draw upon for making a guitar.”1 In the catalogue section of his book, Romanillos cautions the reader that there are doubts about the accuracy of the drawing and in fact the authenticity of the guitar itself, but nevertheless it offered aspiring guitar makers the first opportunity to construct a classical guitar along the lines of that of a legendary luthier. I have acquired2 an original copy of The Guitar Review 1954 and scanned the Hofmeister article/plan, which can be downloaded as a PDF. I don’t know where this guitar is currently held or whether its authenticity was ever resolved, but in the history of classical guitar making it marks an important moment in what was to become a widespread practice (e.g. here and here) of creating scale drawings to study and be guided by in the workshop. As part of my research into the education and training of classical guitar makers in the UK, I am beginning to review the Do-It-Yourself literature on the subject, much of which is aimed at autodidacts with little or no experience of lutherie. I am reviewing the literature fairly systematically to compare the different methodologies of construction as well as the written style, use of language and idiosyncrasies of each book. 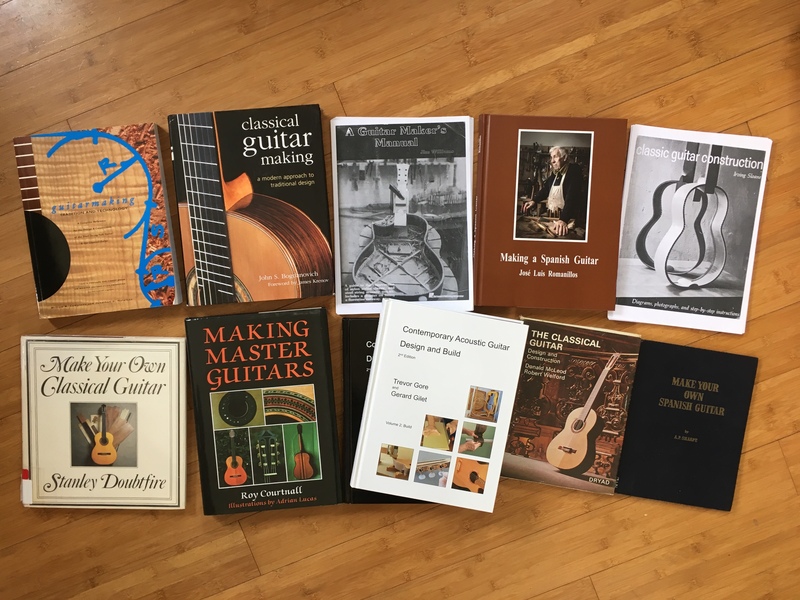 I also make use of the books when making my own guitars, especially when I lack the confidence in my own experience or have made a mistake and want to take the advice of several teacher-authors. On the whole though, I stick to a single methodology and book, written by Roy Courtnall, the luthier who taught me locally. Most of the books listed above will be well known by classical guitar makers. Two books I neglected to include but were listed several times under ‘other’ were Jose Romanillos’ Antonio Torres (1987) and Making a Spanish Guitar (2013). I hadn’t thought to include the 1987 book about Torres among instructional DIY books, but I do understand its significance as a source of learning for classical guitar makers. Not including Romanillos’ 2013 book was simply an oversight. Readers of Romanillos’ books and various interviews will know that he first learned lutherie by following A. P. Sharpe’s book, Make Your Own Spanish Guitar (1957). What is less well-known is that an earlier set of instructions for making a classical guitar were published in Woodworker magazine (Jan/Feb/Mar/May/June, 1955). HOING, Clifford A. (1903-89). A distinguished modern maker who worked at High Wycombe, Bucks. Originally trained as a wood-carver but became during his lifetime one of the most respected violin-and viola-makers. Credited with about 150 handmade instruments with choice wood. Followed classical Italian modelling with one or two of his own features. Diploma of Honour, The Hague, 1949. Instruments signed and branded. See Alburger, and Strad (July 1990), 558. S 11/92/240, 1958, £1,705. Harvey, B. W. (1995) The Violin Family and its Makers in the British Isles: An Illustrated History and Directory. It is worth repeating that Hoing’s series of articles in Woodworker magazine pre-dates the better known book by A. P. Sharpe, Make Your Own Spanish Guitar (1957) by two years. In his first article of the series, Hoing makes an implicit reference to another book by Sharpe, The Story of the Spanish Guitar, which had been published the previous year. Quoting (but not naming) Sharpe, Hoing seems to suggest (see 2nd paragraph in the image below) that the few passing details on guitar construction in Sharpe’s 1954 book were “ignorant” and this motivated Hoing to write the series for Woodworker. I own the 1963 third edition of The Story of the Spanish Guitar and can’t find anything ‘ignorant’ written about the construction of the modern Spanish guitar. Perhaps Sharpe revised it after the first edition. In a 1965 reprint of Hoing’s articles in Woodworker, his criticism was removed. Apart from wanting to address Sharpe’s ‘ignorance’, I suggest there are at least two reasons why Hoing’s article appeared when it did, one specific to the introduction of the classical guitar in Britain and another to do with a post-war culture of DIY. Guitar construction in England rapidly deteriorated [in the late 19th c.] as indigenous luthiers abandoned the mainstream instrument in preference for what Appleby euphemistically termed ‘novelty variants’. English luthiers diligently experimented with the guitar’s physiognomy in an attempt to enhance sound projection by introducing resonators, additional soundboards, unusual bridges, fingerboard keys and extra strings. These were often pretentious inventions, exhibiting inferior aesthetic form and unable to preserve a position in the fretted instrument hierarchy. Moreover, English luthiers failed to acknowledge – or ignored – the metamorphosis occurring in guitar construction. Crucial innovations, pioneered by Antonio de Torres Jurado (1817-92), were disregarded. According to Button’s biography, Bream’s first classical guitar in the Spanish (i.e. Antonio Torres) style, was a Clifford Essex ‘Hauser’ model given to him in 1947 by Terry Usher. Usher is a pivotal figure in the introduction of the modern (i.e. Spanish) classical guitar in Britain. Button writes that Usher began playing the Spanish guitar in 1945 “and announced in 1948 his ambition to ‘establish the classical guitar in Britain as a legitimate instrument by composing, lecturing and giving recitals’. (BMG, February 1948).” (Button, 1997, 68) Usher received a grant from the Arts Council to promote the instrument through a series of lectures and recitals in 1949 and published in 1956 what I believe is the first English-language, organological article on the classical guitar. In that article, Usher writes about a number of specific instruments, including a Clifford Essex guitar from 1953 and a Harald Petersen guitar from 1955. At that time, Clifford Essex was run by A. P. Sharpe, and published the monthly Banjo, Mandolin and Guitar (BMG) magazine. The luthier at Clifford Essex was Marco Roccia, whose work Sharpe celebrates in Make Your Own Spanish Guitar (1957). Roccia had worked for Clifford Essex since 1927 and after serving in WWII, resumed his job and began making classical guitars. Usher writes enthusiastically about Marco Roccia in his 1956 article (p.33) which Sharpe quotes in the Introduction of his 1957 book. Harald Petersen was a Danish luthier who had moved to the UK and sold his instruments through the Spanish Guitar Centre, a business established in 1952 by John William’s father, Len. Bream borrowed the Hauser guitar but two weeks later came across a “dilapidated” model by Spanish luthier, Jose Ramirez, in a shop in London. Bream and his father compared it to the Clifford Essex/Hauser and found the Ramirez to be a better instrument. Once restored by Bream’s father, Bream used the Ramirez to perform for a BBC recording on 30th August 1947. In addition to all of this activity around the emergence of the classical guitar as a concert and recording instrument in the UK, it’s also important to recognise the growing popularity of DIY more generally and therefore the wider context that magazines like Woodworker were part of. Andrew Jackson’s PhD thesis, Understanding the Experience of the Amateur Maker, provides a useful summary of amateur making in post-war Britain (p.22). At that time, there was a shortage of housing and labour and between 1941 and 1951, the only furniture available was through the government’s Utility Scheme. The war had resulted in “an unprecedented level of self-help and resourcefulness” (p.23) Home ownership was being encouraged by banks and building societies and so new owners were faced with having to furnish and manage repairs on their homes rather than ask their landlord. A labour shortage made it difficult to find a tradesman to carry out repairs and so people were encouraged by television and magazines like Woodworker to take up DIY. Looking through the issues of Woodworker from 1955, this social context is made very clear: Along with Hoing’s first article on making a guitar, readers were shown how to make a window seat, bookcases, cupboards, a ‘ladies’ mobile work box’ (to hold sewing materials), and sharing the same page as Hoing’s article were instructions on making a fishing float. So, in 1955, a growing popularity for playing the classical guitar, a lack of reasonably priced and good quality instruments, and a popular culture of DIY was the context in which Hoing, a reputed violin-maker wrote five articles (12 pages in total) for Woodworker on how to make a guitar, at a time when there were no other published sources of information available. Although instructions are very brief by comparison to later books, Hoing offers a range of advice including measurements, making of jigs, choice of wood, how to plane thin pieces of wood, and how to make and work with a bending iron. Illustrations are provided for the rib mould and bending iron. The first article covering the back and ribs amounts to eight paragraphs (two pages including illustrations and plan). The methodology for the rosette is unconventional by today’s standards. Cutting the soundhole out before inlaying the rosette and deciding which face of the wood to use makes later thicknessing of the wood more difficult. Cutting of the circle with “a small cutting gauge” assumes that the maker can fashion a suitable tool. ‘Purfling’ is referred to for the first time and we are left to work out that it must be thin strips of wood suitable for inlay. This example is typical of each step in the building of the instrument. It assumes a level of resourcefulness, confidence and, in a sense, individual ‘freedom’, that gradually disappears with each subsequent guitar making manual since 1955. However, we should also recognise that it is part of a magazine where the techniques of tool and jig making, inlaying, design and measurement are written about on a regular basis, so the article should be seen as a complement to the variety of instruction and learning that the reader is assumed to gain with each issue. A. P. Sharpe’s 1957 Make Your Own Spanish Guitar, although very brief by today’s standards, is almost three times longer (32 pages) than Hoing’s series of articles and, while still assuming some experience and resourcefulness, stands alone as a book and therefore has to provide more detail to the maker than a periodical. It is suggested that the bridge be made of rosewood but failing that another dense wood can be substituted, such as English Walnut. If a softer wood is used, then the bridge should be made thicker to “compensate for the difference in density” (58). Hoing writes that, contrary to other luthiers, he prefers to “rough out” the bridge and glue it before doing the final shaping when the instrument is almost complete. Even in 1955, this seems to have been an unconventional (and irrational?!) approach to making and fitting a key component of the instrument. However, more generously it is again a sign of Hoing’s acceptance that the reader can make up their own mind and use their own judgement and he cautions us that whatever decisions we make, “it must be remembered that work on a musical instrument must be more carefully done than if it were merely a piece of cabinet work, otherwise the tone will be far from musical. There can be no faking of joints in this kind of work.” (58) As such, Hoing establishes lutherie in a hierarchy of practical skills that stands above more domestic DIY projects in Woodworker. A plan for the soundboard is given with sufficient detail, including the direction of grain for the struts and the reader is told to curve the braces to the curve of the top. Finally, the box is closed with warnings about being sufficiently organised, having the right clamps to hand (instructions and an illustration is provided for making such clamps), and ensuring that a good join is made all the way around. The final article, published in June 1955, focuses on ‘Fixing the frets, banding, purfling, and varnishing’. It is two and a half pages long, including illustrations. When installing the frets, Hoing advises us that “some makers notch or burr the bottom edge of the tongue so as to make a better fit. Others run a little painter’s knotting into the cut before fitting the fret.” (June, 121). What is interesting here and found occasionally elsewhere in the series, is how Hoing draws on his understanding of others’ work, presumably having studied their instruments or seen them at work. How else would a maker of fretless instruments (violin, viola) know about notching the tongue of the fretwire? As with a number of specialist tasks, an illustration is provided for cutting and fitting the purfling and banding. This is a difficult task to do well and the instructions are too brief but, viewed more sympathetically, it suggests that Hoing has confidence in his readers’ abilities and willingness to learn from their mistakes. Next, we are instructed to brush on shellac varnish (“no stain should be used on stringed instruments”) and once dry, it is lightly sanded with fine sandpaper. This is followed by a further coat, then two clear coats of varnish, a coat of linseed oil, a coat of amber varnish, then a varnish diluted with meths is polished on. Finally, the guitar is set up and Hoing warns us that “there is no economy in using cheap strings as they break more quickly and do not do justice to your efforts as a maker or player.” (123). Having read through Hoing’s series of articles a few times now, I have got over the brevity of his instructions and admire what he attempted at the time. Presumably given a limited amount of space in a popular, monthly magazine, he, like Usher and Sharpe, were contributing what they could to promote the classical guitar to a wide audience and support a growing demand for the instrument. In my interviews with luthiers so far, I know of one person who used Hoing’s articles to construct their first guitar, having already apprenticed as a carpenter, and he went on to make highly regarded instruments and co-author a DIY book for classical guitar making. I don’t think we can criticise Hoing for what he attempted, even if his instructions appear brief and some of his methods are unconventional today. He did for the classical guitar, what no-one else in Britain had done. Given his experience as a violin maker, I am now curious as to what books or magazine articles were available to British readers at that time for making violins and how his writing compares or departs from an established genre of written lutherie instruction, if there was one. Source: Nathaniel Dorsky (2005) Devotional Cinema, 2nd ed., Berkley: Tuumba Press, 24-25. “For alchemy to take place in a film, the form must include the expression of its own materiality, and this materiality must be in union with its subject matter. If this union is not present, if the film’s literalness is so overwhelming, so illustrative, that it obliterates the medium it is composed of, then one is seduced into a dream state of belief or absorption that, though effective on that level, lacks the necessary ingredients for transmutation. Such a film denies its totality. It denies the fact of what it is actually made of. The instinct to express the union of material and subject occurs at the beginning of known human expression. The devotional cave art in southern France and northern Spain often plays with the contours of the cave walls to enhance the hallucination of the bison or horse depicted on them. Egyptian sculpture is as much about the unceasing nature of stone as it is about the unceasing glance engraved on that stone. In French religious stone carving of the late twelfth century, the stone itself is luminous, as both material and expression. The stained glass of the same period was born out of a love of the elemental glory oflight, color, and glass, while at the same time relating biblical tales or the lives of saints. Similarly, Bach’s organ chorale preludes are as much an expression of skeletal fingers pressing down on ivory keys and releasing air through pipes as they are melodic evocations of prayer. Mozart, born into the age of classicism, wedded his classical style to the human metabolism in every detail. The texture of the instrumentation, the key changes, and the depiction of conversation and emotion through melodic line are the music itself and at the same time are a primordial mirror or example of what it is to be fully human. We hear ourselves at our alchemical best.